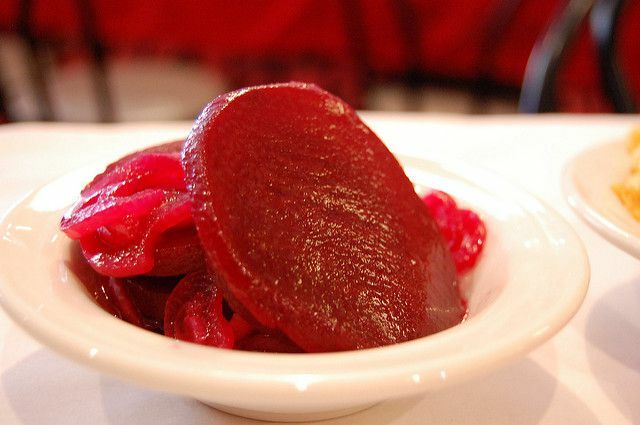 Beets are wildly popular with Eastern Europeans. They are delicious in multiple preparations, but pickling is a great way to use a surplus of beets, retain their flavor, and enjoy them for weeks to come. Since this recipe is quick-pickled and isn't processed using the hot- or cold-pack method, it is meant to be eaten within a few weeks of making it. Pickled beets with onions make a nice addition to summer cookouts. The sour flavor of the pickled beets can balance any fatty barbequed meat or a juicy burger. During the pickling process, the beets and red onions will release their colorful juices. A nice ruby red jar of pickled beets and onions with a cute ribbon around the jar makes a wonderful homemade host or hostess gift. Bring a large pot of salted water to a rolling boil. Add beets, reduce heat, and simmer until tender, 12 to 15 minutes. Drain well. When cool enough to handle, slip off the skin. Place beets in a nonreactive bowl and set aside. In a small saucepan, combine onions, sugar, vinegar, salt, and 2/3 cup water. Bring this mixture to a boil over high heat. Simmer 5 minutes and make sure that the sugar and salt are fully dissolved into the water. Pour the hot marinade over beets, and then allow the beets to cool to room temperature. Cover the beets well and refrigerate for several hours or overnight before serving. If you prefer, divide the beet and onion mixture into individual jars for gifts. If you are giving this beet and red onion mixture as a gift, remind your recipient that these beets are quick pickled and must be refrigerated and used within two weeks. It is important to note that beets will naturally stain your hands, cutting boards, wooden spoons, and other cooking instruments. If you are very concerned about staining, wear an apron to protect your clothing and wear rubber gloves when handling the beets. These colorful, quick-pickled beets can be served a number of different ways. They are a nice addition to any charcuterie board (serve them with toothpicks to prevent staining fingers), as a side dish or accompaniment to grilled sausages, or even as a juicy and colorful standard pickle alternative on a sandwich.